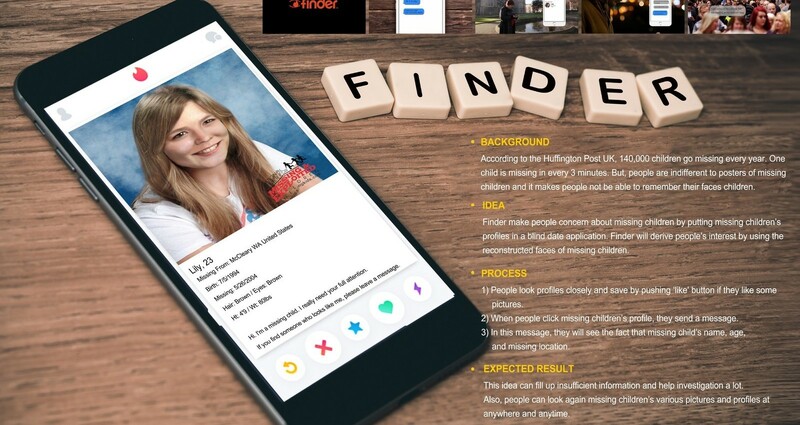 Put the missing child's profile in the dating app Tinder to get the user interested in the missing child. Click on the missing child's profile to see the location, age at the time of their disappearance, and physical features. According to the Huffington Post UK, 140,000 children go missing every year. One child is missing in every 3 minutes. But, people are indifferent to posters of missing children and it makes people not be able to remember their faces. So, finder make people concern about missing children by putting missing children’s profiles in a blind date application. Finder will derive people’s interest by using the reconstructed faces of missing children. This idea can fill up insufficient information and help investigation a lot. Also, people can look again missing children’s various pictures and profiles at anywhere and anytime.